Nothing can make up for missing a traditional American Thanksgiving meal with family and friends, but I definitely had a good one and even ate some turkey! On the big day, I presented a basic powerpoint to my 9th, 8th and 6th forms about the holiday’s history, modern traditions and cuisine. Then we all made hand turkeys on which we wrote five things we are thankful for this year. My aunt Jill taught me this tradition at the Thanksgiving table one year, and I’ve tried to do it every year since then. As for my colleagues, I baked some cookies the night before and gathered some sweets. 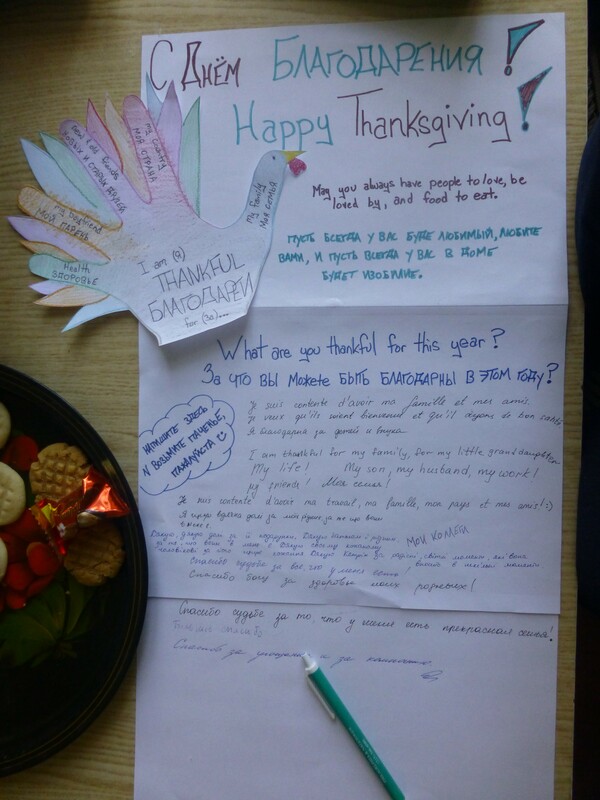 On Thursday, I brought them in and put them on my desk next to a paper asking them to write what they are thankful for this year. In order to take a sweet, they needed to write something. At first they were really confused and thought it was cute. One said, “Oh good job, Katherine.” When I responded, “No seriously, what are you thankful for this year?” they realized it really was my tradition, thought for a minute and wrote something down. Garrett, Vovo and I celebrated the night of with some chicken grub and carrot salad. On black friday, I didn’t buy a single thing. I really miss staying awake the whole night with Lauren and Beth until the shopping malls opened and we could watch all the crazed people running around to sales. However, the reaction of my colleagues and students to the description and photos of Black Friday were almost as good. Indeed, what other culture pitches tents outside their favorite shop in order to be in the stampede’s front line of customers at 1am? 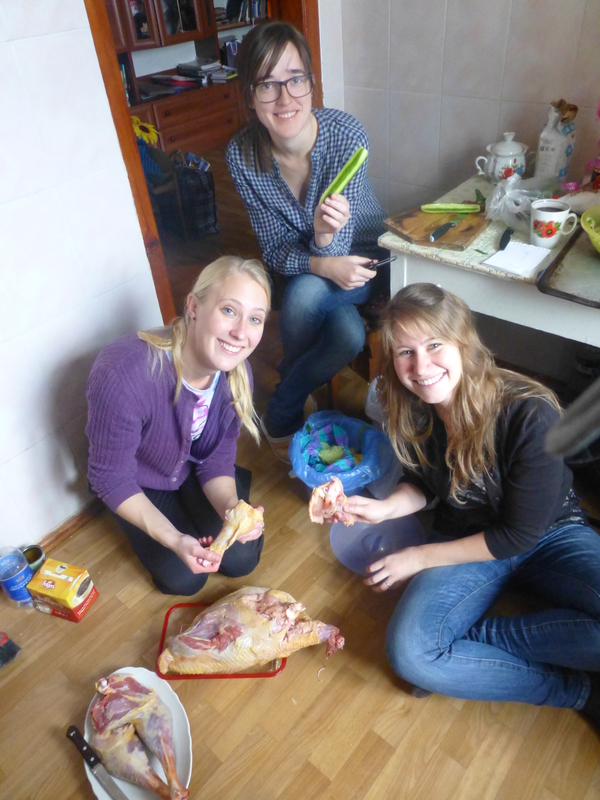 Madeline, Ana and I carving the raw turkey so I wouldn’t take so long to cook. 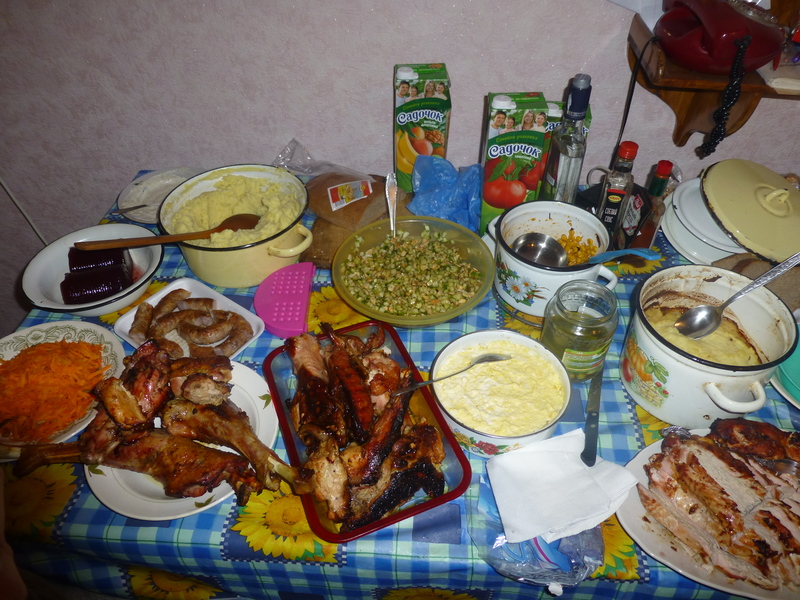 My Oblast mates and I celebrated Thanksgiving together in a town called Krolovets, about 3 hours north of Romny. In the morning, we hosted our traveling English camp, Camp Excite, then gathered for a feast afterwards. 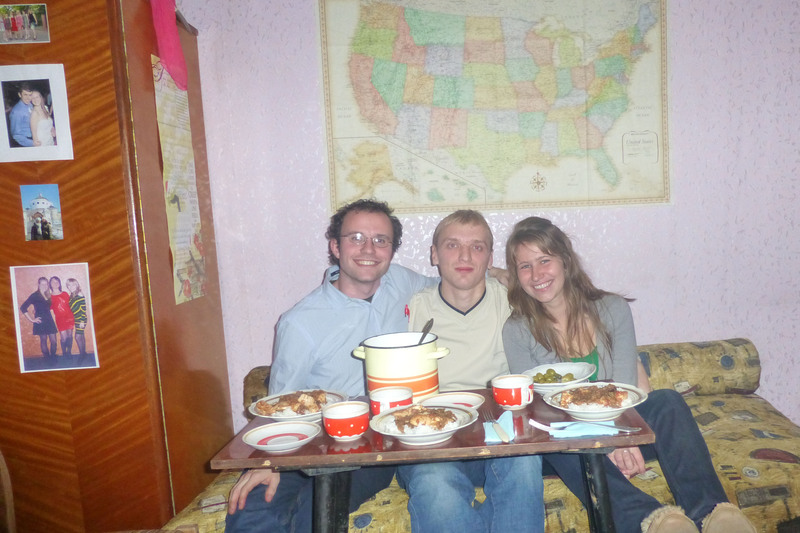 We were joined by our fellow PCV’s neighbor, a bold Ukrainian artist with an apartment to match his lucky number reading skills. If you are interested, you can check out his website here. Together, we ate turkey, green beans casserole, shepherd’s pie, salad pumpkin pie and even gravy. We scarfed down our meals in about 30 minutes then rolled around the rest of the night groaning about how much our stomachs hurt. It was wonderful. Our delicious spread. Complete with cranberry sauce and a touch of Ukrainian mayonaise salad, sausage and pickles. Funny you should write that “I really miss staying awake the whole night with Lauren and Beth until we could visit the shopping mall and watch the crazed people …” because that is proving to be extremely short-lived as traditions go. This year, many stores opened at midnight, and a few as early as 10 pm. Thankfully (! ), Jill’s tradition is more enduring. You two deserve a medal for carving up that turkey! I gave me the opportunity to learn that turkeys have really flexible necks 🙂 thanks for hosting you two! 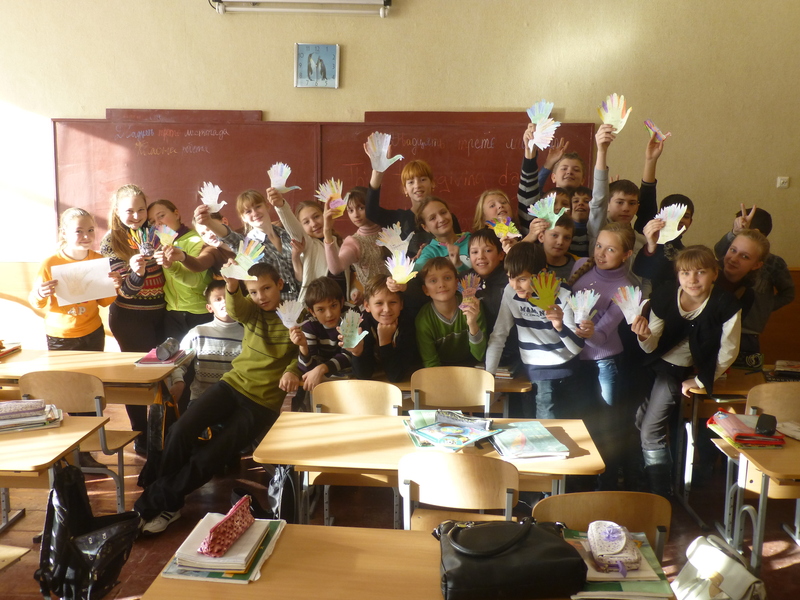 haha the hand turkeys are so cute! def havent seen them before 🙂 so what were your colleagues/ students thankful for in the end? same things as most of us or is the thankfullness a learned/ cultural skill?